The first demo of LIFE has been released! LIFE is an adventure game set in the world of Doctor Who. As the player, your planet has been destroyed by the Dalek Empire, and your memory of the events half-obliterated; having been saved in unclear circumstances, you find yourself on a resistance base from which you can begin to fight back against the daleks who destroyed your world. The resistance have a dalek of their own, that said: the Good Dalek, as they call it. Its single great pronouncement is their motto, a motto that has helped fuse a once-disparate collection of species into a desperate alliance to take the fight back to the Daleks and save the galaxy. Badly made pixel-style graphics and backing music which I'm going to call a "multimedia experience"
There are probably bugs. If you can distinguish them from the features, brilliant, if not we'll claim they're features. 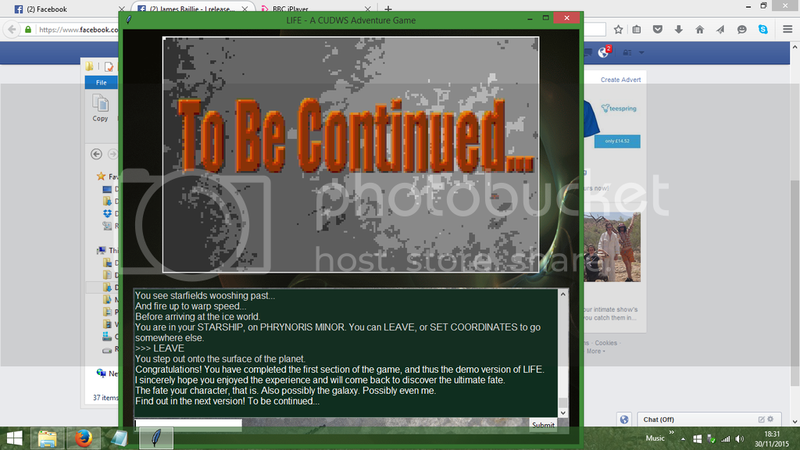 The first five users to post a screenshot of the To Be Continued screen will be listed here and on the CUDWS website! Any bug reports are very much welcome, please post here, comment on the CUDWS FB page, or message me. Also PLEASE NOTE that certain features of this, especially the backing music, are placeholders and will be replaced at some later point. Couldn't get past the introduction. Have no idea how to do text adventures. Also couldn't throw thermal pod. Throwing thermal pod will be a thing, in the right circumstances. It kinda makes most sense for it to happen in the next bit I'm working on though as that actually will have ice caves and everything! To start you type start in the box and then hit enter, same with basically any other commands or things you want to do, just type it in the box, hit enter, and the game should do it? When I tried to use the FORM TOP, it told me I had no item I could use it with (even though I had the FORM BOTTOM). I worked out the correct command in the end, but that response was clearly a lie. Also, the format for setting coordinates confused me at first, didn't realise the X and Y were part of it. Might be better to give ~X11, Y85~ as the format example? Or I'm just dumb. I couldn't find a way to view my complete inventory - is there such a way? Also curious: will species have any impact in the longer game? Du bist kein Schmetterling! Du bist nur eine kleine Raupe in Verkleidung! - Noted with the FORM parts, I'll do some sort of fix for that. - Yes, species will have an effect, basically each species will be able to ignore/dodge/get other ways through certain puzzles and may also get a species-specific easter egg or two. An obvious one is that you won't need the thermoregulator to walk around on Phrynoris if you're an Ice Warrior. Right, by introduction I meant after picking the options etc. I tried to go places and look at things but it kept telling me to try something else. Sorry I'm dumb. If you type LOOK it tells you useful information about what you can look at and go to - generally the readout gives directions you can go in or things you can look at in full caps. You are in Asteroid Base Alpha H8/00 Alpha, better known simply as BASE. Elevation pods can be taken to lead SOUTH, WEST, and UP. There is a large POSTER here. Indicates SOUTH, WEST, UP, and LOOK POSTER might all be good commands to have a go at, and so on.